Copper is a chemical element with the symbol Cu (from Latin: cuprum) and atomic number 29. It is a ductile metal with very high thermal and electrical conductivity. Pure copper is soft and malleable; a freshly exposed surface has a reddish-orange color. It is used as a conductor of heat and electricity, a building material, and a constituent of various metal alloys. The metal and its alloys have been used for thousands of years. Revelation 1:15 and his feet were like fine copper when glowing in a furnace; and his voice was as the sound of many waters. Apocalypse in: G. Ancel Killion A Better Understanding, Xlibris Corporation, 25 March 2010, p. 292. Copper deficiencies are thought to be linked to living in, and eating foods grown in, areas where the soil has been depleted of this mineral. Phyllis A. Balch in: Prescription for Nutritional Healing,Penguin, 2006, p. 340. Trace amounts of copper are essential for the human body. Since copper is not manufactured in the body it must be taken in through the diet. Copper is involved in the function of the nervous system. As with all toxic minerals, excess amounts of copper in the body can be toxic. Phyllis A. Balch in: "Prescription for Nutritional Healing", p. 340. He was only about as tall as Dorothy herself, and his body was round as a ball and made out of burnished copper. Also his head and limbs were copper, and these were jointed or hinged to his body in a peculiar way, with metal caps over the joints, like the armor worn by the knights in days of old. He stood perfectly still, and when the light struck upon his form it glittered as if made of pure gold. Lyman Frank Baum in: The Complete Oz, Volume I, Dallas Tanner, 22 April 2008, p. 117. Jöns Jacob Berzelius in: Ursula Klein Experiments, Models, Paper Tools: Cultures of Organic Chemistry in the Nineteenth Century, Stanford University Press, 2003, p. 10. Chemical Secrets of Copper water: Immunity, Fertility. Dr.Shirish Bhate in: "Why our ancestors used copper utensils?" Bible in: The variorum teacher's editions of the holy Bible. With which is incorporated the Aids to the student of the holy Bible, 1882, p. 372. Jorge Luis Borges in: Other Inquisitions, 1937-1952, University of Texas Press, 1964], p. 103. At the end of the 19th century beaten copper was favoured by the craftsmen of the Arts and Crafts Movement in Europe and North America....the combination of enamel work and copper was also popular among designers and craftsmen. Gordon Campbell in:The Grove Encyclopedia of Decorative Arts, Volume 1, Oxford University Press, 2006, p. 273. The black patinated shakudo copper alloys inlaid with silver, gold and brass have been used extensively by the Japanese, particularly for sword guards and other sword fittings. Gordon Campbell in:"The Grove Encyclopedia of Decorative Arts, Volume 1", p. 273. The world is an old woman, and mistakes any gilt farthing for a gold coin; whereby being often cheated, she will thenceforth trust nothing but the common copper. Thomas Carlyle in:Blackwood's Magazine, Volume 85, W. Blackwood, 1859, p. 131. I looked at the ornaments on the desk. Everything standard and all copper. A copper lamp, pen set and pencil tray, a glass and copper ashtray with a copper elephant on the rim, a copper letter opener, a copper thermos bottle on a copper tray, copper corners on the blotter. holder.There was a spray of almost copper-colored sweet peas in a copper vase. It seemed like a lot of copper. Raymond Chandler in: The Lady in the Lake and Other Novels, Penguin UK, 7 June 2001, p. 133. 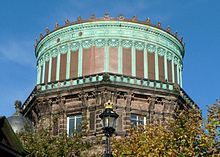 The refurbishment of the two Grade A listed copper domes that top the 1894 observatory building at the Royal Observatory, Edinburgh was completed recently. The refurbishment consisted of repairs and replacement to copper ornaments, copper cladding, timber cladding and stonework. D Blake & Co in: Royal Observatory, Edinburgh, D Blake & Co. The use of copper and bronze in the architecture of public and prestige buildings has a long history. Doors and even whole buildings were sometimes clad in beaten copper or bronze. The set of massive copper bands on the gates of the Assyrian city of Balawar (8th century BC) is the only surviving example of what was then quite a standard form of embellishment and visible display of wealth and power. J. Curtis (1988) quoted in: Gerald W. R. Ward The Grove Encyclopedia of Materials and Techniques in Art, Oxford University Press, 2008, p. 144. Ayurveda recommends storing water in Copper Vessels. Ancient Egyptians used Copper Vessels to keep water fresh. Even today, management of Shiva temple at Rameswaram uses large sized Copper vessels to store water brought from river Ganges to offer to lord Shiva. Water, stored thus, stays fresh for years together. According to scientists, copper vessel can be the answer to kill the `E-Coli' bacteria which causes food poisoning. British scientists are carrying out research on copper and concluded that copper ions kill these harmful bacteria, a capability not found in any other metals including gold. Paul Davies in:The secret of life won't be cooked up in a chemistry lab,The Guardian, 13 January 2013. A man cannot be killed in modern manner without copper. Wade Davis in: Brad Tyer Opportunity, Montana: Big Copper, Bad Water, and the Burial of an American Landscape, Beacon Press, 26-Mar-2013, p. 45. David Dean in Dead on the Fourth of July (David Dean Mysteries) (Chapter XIV, p. 3), publicbookshelf.com. My copper lamps, at any rate, For being true antique, I bought; Yet wisely melted down my plate, On modem models to be wrought. Daniel Defoe in Robinson Crusoe in: Crusoe, written by himself, 1815, p. 506. I used to sit, think, think, thinking, till I felt as lonesome as a kitten in a wash-house copper with the lid on; but I believe the old broker's men, who are regularly trained to it, never think at all. Charles Dickens in The works of Charles Dickens. Household ed. [22 vols. Orig. issued in monthly parts, 1871, p. 13. When they were all tired of blind-man's buff, there was a great game at snap-dragon, and when fingers enough were burned with that, and all the raisins were gone, they sat down by the huge fire of blazing lags to a substantial supper, and a mighty bowl of wassail, something smaller than an ordinary wash-house copper, in which the hot apples were hissing and bubbling with a rich look, and a jolly sound, that were perfectly irresistible. The entire population of Liberty Island is small enough to fit into one copper-skinned palm of the colossal statue that serves as its only industry. Georgia Dullea in: Little Bits of History The Two Sisters, patriciahysell.wordpress.com. Georgia Dullea in: "Little Bits of History The Two Sisters"
Bill Gates in: Jeffrey Kluger Bill Gates Talks to TIME About the Three Myths of Global Aid, Time, 21 January 2014. Hermann von Helmholtz in:Nineteenth-Century Science: An Anthology, Broadview Press, 10 March 2000, p. 296. Solomon was a 'copper king', and all along that Araba, on both sides, we found many copper mines and smelting stations, all attributable. Cyrus Herzl Gordon in: The Living Past, John Day Company, 1941, p. 31. Oliver Wendell Holmes, Sr., in: Oliver Wendell Holmes and the Culture of Conversation, Cambridge University Press, 16-Aug-2001, p. 86. Thomas Hood in: Michael Hanne Literature and Travel, Rodopi, 1993 , p. 4. Instead of the copper I will bring gold and instead of the iron I will bring silver, and instead of the wood copper and instead of the stones iron. And I will make Peace your guard and your rulers Righteousness. ...I went to Westinghouse, I got 400 pounds of translator steel, 22 miles of copper wire, and I assembled a 6-kilowatt, 2.3 million electron accelerator in the garage. - Michio Kaku. Sailing through the Azure vapours. Kalevala, The Kalevala, Abela Publishing Ltd, 1 March 2010, p. 734. If certain bacteria, fungi, or algae inch across something made of copper, they absorb copper atoms, which disrupt their metabolism (human cells are unaffected). The microbes choke and die after a few hours. Shakudō (red copper) is Japanese copper which consists about 95% copper, 1 percent silver and 1-5 percent gold. Before a suitable treatment of its surface, it has a dark copper colour, but when completely pickled it acquires a rich black surface with a violet sheen...Needham Joseph. Shakudō (red copper) is Japanese copper which consists about 95% copper, 1 percent silver and 1-5 percent gold. Before a suitable treatment of its surface, it has a dark copper colour, but when completely pickled it acquires a rich black surface with a violet sheen. It can be treated to form an indigo/black patina resembling lacquer. Unpatinated shakudō visually resembles bronze; the dark color is induced by applying and heating rokushō, a special patination formula. Mizhavu is a big copper drum played as an accompanying percussion instrument in the Koodiyattam. It is played by the Ambalavasi Nambiar community. Alluvial copper is generally believed to be the first metal ore that was fashioned by Neolithic humans into tools, weapons, and ornaments approximately 10,000 years ago. Carolyn A. Krebs in: Groundbreaking Scientific Experiments, Inventions, and Discoveries of the Ancient World, Greenwood Publishing Group, 2003, p. 247. Essentially Copper is a naturally occurring element with an average concentration of about 50 ppm in the earth's crust. It is present as an essential element in all higher plants and animals and is one of the few chemical that occurs terminologically in the elemental form as metallic copper. Günter Joseph, Konrad J. A. Kundig in: Copper: Its Trade, Manufacture, Use, and Environmental Status, ASM International, 31 December 1998, p. 377. And there may be many others, but theyhaven't been discovered. Tom Lehrer in: Karen Dolby Mrs Dolby's Memory Magic: A Comprehensive Compendium of Tools, Tips and Exercises to Help You Remember Everything, Random House, 10-November 2009, p. 118. If two districts, one of which possessed a rich copper mine, and the other a rich tin mine, had always been separated by animal passable river or mountain, there can be no doubt that on the opening of a communication, a greater demand would take place and a greater price would be given for tin and copper. Thomas Robert Malthus in: Principles of political economy considered with a view to their practical application, W. Pickering, 1836, p. 383. Gold doubloons and double moidores, louis d’ors and portagues. John Masefield in: Tom Peete Cross, et al., Good Reading, Volume 2, Ginn, 1938, p. 68. Copper wands were created for a variety of purposes. Please be advised that is just a list accumulated from many sources of information and does not mean that this is true. Some of these ideas come from long standing belief systems and old wives tales. In the last four days I have got the spectrum given by Tantalum, Chromium, Manganese, Iron, Nickel, Cobalt, and Copper and part of the Silver spectrum.... - Henry Moseley. In the last four days I have got the spectrum given by Tantalum, Chromium, Manganese, Iron, Nickel, Cobalt, and Copper and part of the Silver spectrum. The chief result is that all the elements give the same kind of spectrum, the result for any metal being quite easy to guess from the results for the others. This shows that the insides of all the atoms are very much alike, and from these results it will be possible to find out something of what the insides are made up of. Henry Moseley in: J. L. Heilbron H. G. J. Moseley: The Life and Letters of an English Physicist, 1887-1915, University of California Press, 1974, p. 209. My soul is a canvas stretched across four wooden corners and tacked with coppernails that sink into the edges of timber like teeth. My art is nothing less than my salvation. Keariene Muizz in: Standing the Test of Time, NY Arts Magazine. British archaeologists have long been aware that there was a copper using phase before the advent of the Bronze Age, they have not – until recently – seen fit to define a Copper Age or chalcolithic (after the Greek words for copper and stone for British prehistory. Stuart Needham in: Julian Heath Life in Copper Age Britain, Amberley Publishing Limited, 30 September 2013, p. 7. But it doesn't contain potassium cyanide. It doesn't even contain copper sulfate or anything else interesting because all the interesting chemicals are considered dangerous. Linus Pauling in: Uncle Tungsten: Memories of a Chemical Boyhood, Pan Macmillan, 16 June 2011, p. 237. John Piper in Kevin Cross Embezzlement: A True Crime Story, Bridge Logos Foundation, 2010. If complete and utter chaos was lightning, then he'd be the sort to stand on a hilltop in a thunderstorm wearing wet copper armour and shouting 'All gods are bastards'. 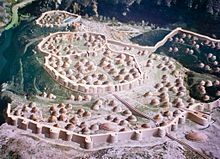 Model of a Copper Age walled city, Los Millares, Iberia. Archaeologists have uncovered the oldest securely dated evidence of copper making, from 7,000 years ago, at the archaeological site of Belovode, Serbia...this site on the Rudnik mountain contains the world's oldest securely dated evidence of copper making at high temperature, from 5,000 BC. While reading in a textbook of chemistry,... I came across the statement, nitric acid acts upon copper. I was getting tired of reading such absurd stuff and I determined to see what this meant. Copper was more or less familiar to me, for copper cents were then in use...Ira Remsen. While reading in a textbook of chemistry, … I came across the statement, 'nitric acid acts upon copper. I was getting tired of reading such absurd stuff and I determined to see what this meant. Copper was more or less familiar to me, for copper cents were then in use. I had seen a bottle marked 'nitric acid' on a table in the doctor's office where I was then 'doing time.' I did not know its peculiarities, but I was getting on and likely to learn. The spirit of adventure was upon me. Having nitric acid and copper, I had only to learn what the words 'act upon' meant... I put one of them [cent] on the w:Table:table, opened the bottle marked 'nitric acid'; poured some of the liquid on the copper; and prepared to make an observation. But what was this wonderful thing which I beheld? The cent was already changed, and it was no small change either. A greenish blue liquid foamed and fumed over the cent and over the table. The air in the neighborhood of the performance became colored dark red. A great colored cloud arose. This was disagreeable and suffocating—how should I stop this? I tried to get rid of the objectionable mess by picking it up and throwing it out of the window, which I had meanwhile opened. I learned another fact—nitric acid not only acts upon copper but it acts upon fingers. The pain led to another unpremeditated experiment. I drew my fingers across my trousers and another fact was discovered. Nitric acid acts upon trousers. Taking everything into consideration, that was the most impressive experiment, and, relatively, probably the most costly experiment I have ever performed. Ira Remsen in: American Chemical Society Laboratory Manual to Accompany Chemistry in Context: Applying Chemistry to Society, McGraw-Hill Higher Education, 10-Feb-2005, p. vi. 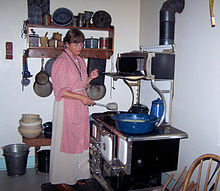 This time, instead of heading for the white room, she hung up his overcoat and led him to the kitchen, which was done in what Banks thought of as a sort of rustic French style: lots of wood paneling, and cup-boards copper-bottomed pots and pans hanging on hooks on the wall, flower-patterned mugs on wooden pegs, a few potted plants, a vase of chrysanthemums on the table and a red-and-white checked table cloth. - Peter Robinson. This time, instead of heading for the white room, she hung up his overcoat and led him to the kitchen, which was done in what Banks thought of as a sort of rustic French style: lots of wood paneling, and cup-boards copper-bottomed pots and pans hanging on hooks on the wall, flower-patterned mugs on wooden pegs, a few potted plants, a vase of chrysanthemums on the table and a red-and-white checked table cloth. Peter Robinson in: Innocent Graves, Pan Macmillan, 21 August 2009, p. 140. Money is different from all other commodities: other things being equal, more shoes, or more discoveries of oil or copper benefit society, since they help alleviate natural scarcity. Murray Rothbard in:Making Economic Sense, Ludwig von Mises Institute, p. 274. Rumi in: Rumi & Self Psychology, Self Knowledge Base, p. 21. If I were to place the earth upon a scale and balance it with a single copper coin; and if I were to become so great that I could not be contained, and if I were to control and lead all; and if I were to possess so much power within my mind that I could cause others to do my bidding - so what? Sri Guru Granth Sahib in : The Voice of the Prophets: Wisdom of the Ages, Volume 2 of 12, Lulu.com, 1 November 2005, p. 217. Several of his [Tyagaraja] songs were discovered engraved on copper plates in a sealed chamber in the Tirumala temple at the turn of the last century. V.Sriram in: A brief history of Carnatic Music, Nadasurabhi. I sit here in the upper circle surrounded by copper and gold, and smile with joy under my fly net as all the light, glory and quivering brightness passes slowly and freely before my eyes. Nothing happier than this. I shout and laugh at my immense wealth, all free and without responsibility. Who could steal this from me? No one. Arthur Streeton in: Sir Arthur Streeton, White Hat. We store drinking water in copper pots which has a number of health benefits including purification of water by killing pathogens. The copper platina-clad statue, dedicated on 28 October 1886, commemorates the centennial of the United States and is a gesture of friendship from France to America. Fredric Auguste Bartholdi sculpted the statue and obtained a U.S. patent useful for raising construction funds through the sale of miniatures. - Cara Sutherland. 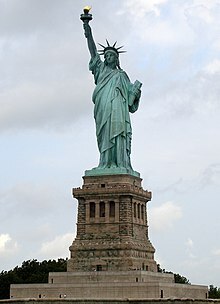 The copper platina-clad statue, dedicated on 28 October 1886, commemorates the centennial of the United States and is a gesture of friendship from France to America. Fredric Auguste Bartholdi sculpted the statue and obtained a U.S. patent useful for raising construction funds through the sale of miniatures. Cara Sutherland in: The Statue of Liberty, Barnes & Noble Publishing, 2003, p. 36. Bell laboratories used emission spectrography to compare samples of copper from the Visnes Mines and from the Statue of Liberty, found the spectrum of impurities to very similar, and concluded that the evidence argued strongly for a Norwegian origin of the copper. Other sources say that the copper was mined in Nizhnyi Tagil. The copper sheets were created in the workshops of Gaget Gauthier company, and shaped in Ateliers Mesureur in the west of Paris in 1878. Cara Sutherland in:"The Statue of Liberty", p. 36. Henry David Thoreau in:When the Moon Slips Away: Rejoicing in Everyday Miracles, Twenty-Third Publications, 2009, p. 67. They don’t drink it. They can’t drink it, sir. Give an Irishman lager for a month, and he's a dead man. An Irishman is lined with copper, and the beer corrodes it. But whiskey polishes the copper and is the saving of him, sir. Mark Twain in: Life on the Mississippi, The Floating Press, 1-April 2011, p. 189. As copper can be difficult to cast but easy to shape by hammering, it has been used since very early times to make items of beaten sheet metal...Copper [also] takes fire gilding better than its alloys, and many examples of the deliberate use of copper, rather than the more usual bronze or brass, for objects to be fire gilded are known. Copper has a pleasing and distinctive colour and has always been widely used for inlays into other metals, notably silver or the more golden bronze or brass. Gerald W. R. Ward in: The Grove Encyclopedia of Materials and Techniques in Art, Oxford University Press, 2008, p. 143. Copper had already been known for thousands of years by the time Otzi forged his axe. Archaeologists, found humankinds earliest use of element in the modern-day Turkey, Iran, and Iraq, the same spots that spawned civilization. A copper pendant found in northern Iraq dates to 8,700 years before Christ, plenty old enough to engender myth. The Greek island Cyprus took its name from Copper’s Latin cupras and the plentiful stores of green rocks that made it the go-to-source for the copper seeking civilizations of Greece, Rome, Phoenicia and Ionia in the three thousand years pre-dating Jesus. Venus was copper’s goddess, wearing an Egyptian ankh, emerging from the waves near her island protectorate to confirm her charms in a mirror made from the polished pink metal. The Greeks knew copper as an antiseptic and mixed glittery flakes with honey as a dressing for wounds. The patrons of Sinai Peninsula, another copper bonanza, was named Hather, the Egyptian Goddess of sky, music, dance, and art, also known as Lady of Malachite. Malachite and azurite, copper ores coloured blue and green, were ground into the makeup that painted Egyptian eyelids aqua. Human blood does contain traces of copper, but our blood is primarily iron-based via the hemoglobin that delivers oxygen to the cells. Iron is red, Crabs have copper-based blood. It’s blue. Native copper, the orange-pink variety scattered in plain sight, is rare, mainly picked over. The metal is more commonly found in ore form, bound in the rock. The Ojibwa invested the metal with magic and handled their heirloom stashes of copperfishhooks, pebbles, needles and knives with superstitious zeal. Long before Champlain was given the hunk of copper, the Ojibwa deity Missibizi was said to reside on canoe-shaped island in Lake Superior called Michipicoten, fifteen miles long and made of solid copper, that Missibizi liked to paddle across the waves from his helm on the island’s hilly crest. Michipicoten’s surf-splashed flanks were reputedly littered with copper nuggets, the size of softballs, and , according to legend, when passing fishermen take a few for themselves Missibizi jealously struck them dead. The Ojibwa invested the metal with magic and handled their heirloom stashes of copper fishhooks, pebbles, needles and knives with superstitious zeal. In 1911, at a luncheon feting guest of honor Edison at a New York City “Electrical Exposition,” copper producers gave the inventor a gift: a cubic feet of solid Cu, a 486-pound squared off Ontonagon boulder of appreciation inscribed with statistical gratitude. ...liquors are brewed in shiny copper stills. Fly fishers ply Copper John trout flies, with copper-wire abdomens, in running waters everywhere. The shiny raw copper colour attracts trout – just one form in which the metal slays unsuspecting fish. A person cannot live in a modern manner without copper. Electricity flipped the switch. While the pre-modern world’s use of copper depended on hardened alloys with other metals, the industrialized world’s dependence relies on alloyed copper, purged of impurities, to conduct electricity. Today an average American home is laced with 439 pounds of copper wiring and plumbing, with another hundred pounds embedded in household appliances like water heaters, air conditioners, and refrigerators. The average American car is strung with more than 600,000 feet of the stuff. In the United States alone, 130 million cellphones are retired very year, containing 2,100 metric tons of copper – enough to build twenty-six new copper-sheathed Statues of Liberty. Craft beers and liquors are brewed in shiny copper stills. Fly fishers ply Copper John trout flies, with copper-wire abdomens, in running waters everywhere. The shiny raw copper colour attracts trout – just one form in which the metal slays unsuspecting fish. Seneca the Younger in: p. 45. Butte mythology minted three copper kings; Willima Andrews Clark, Marcus Daly, and Augustus Heinz. While China, the world’s largest copper importer, drives global demand, the metal is increasingly sourced in South America. Chile now produces about 36 percent of world demand, and Peru pitches in 15 percent, making them the top two copper producers in the world. Much copper was used in manufacturing vessels for the Temple and especially for the Tabernacle: clasps, sockets, rings, posts of the enclosure, lavers, etc. The biblical description of copper weapons indicates a highly developed military culture, e.g., the description of Goliath:..Bible. ...Copper was fashioned into a symbol for the Israelites in the desert in the form of a serpent of copper made by Moses.-Bible. Six metals are mentioned in the Bible and in many passages they are listed in the same order: gold, silver, copper, iron, tin, and lead... 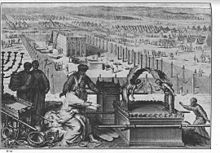 The Bible speaks of the high qualifications necessary for the specialized metalwork of the Tabernacle: "I have endowed him with a divine spirit of skill, ability, and knowledge...to make designs for work, in gold, silver, and copper... Solomon was forced to bring the craftsman Hiram from Tyre to work in copper. The copper referred to in the Bible is not pure copper but an alloy of copper and tin. This alloy – bronze – was the most useful and important metal from the beginning of the third millennium BC to the 13th century BC when it began to be replaced by iron. Copper mines in the ancient Near East were located in Cyprus (from which the name copper is apparently derived), Sinai, and Egypt. It was the main metal extracted in Ereẓ Israel in antiquity and is the only one mined there today. Copper is usually extracted from sulfide minerals, and partly from silicates, and carbonates; very small amounts of native copper are also found. Much copper was used in manufacturing vessels for the Temple and especially for the Tabernacle: clasps, sockets, rings, posts of the enclosure, lavers, etc. The biblical description of copper weapons indicates a highly developed military culture, e.g., the description of Goliath: "He had a helmet of bronze on his head, and he was armed with a coat of mail, and the weight of the coat was 5,000 shekels of bronze”. Copper was fashioned into a symbol for the Israelites in the desert in the form of a serpent of copper made by Moses. In its use in vessels for the Tabernacle and Temple and for weapons, copper symbolized strength and rigidity – The skies above your head shall be copper. It also denoted drought – "I will make your skies like iron and your earth like copper". The word for chains (neḥushtayim) is also derived from copper. Not only the heaven and earth but also the Israelites are compared with rigid copper: "your forehead copper”. This page was last edited on 11 April 2018, at 13:35.